The VIPER VE17HSP is a single disc machine designed for scrubbing and buffering tasks. Through platform design we can offer this VE machine with a attractive quality/price level. Simple and easy to use controls. The VIPER VE17HSP single disc is robust, reliable and service friendly. 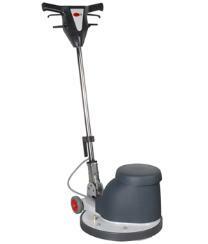 With this ergonomic design you can easily scrub and buffer hard floors.